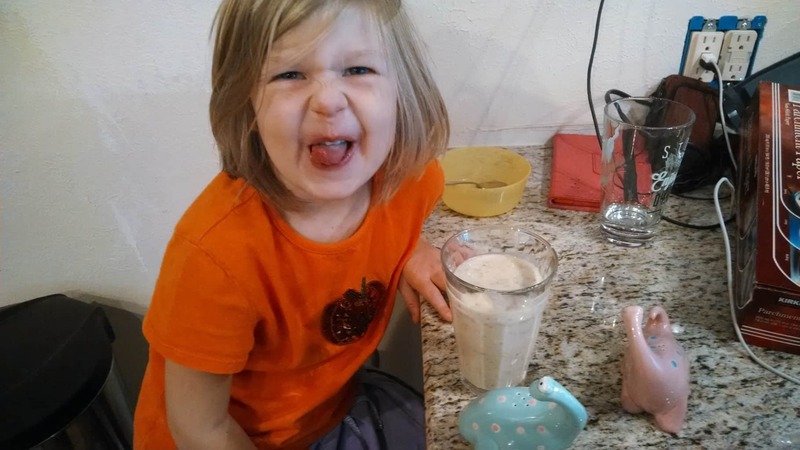 This week, the blog takes a slight diversion while I experiment with soylent, a food substitute. At the end of each day, I’ll write a brief post telling you how it went. Here is my update for Monday. #1: My pee is now this amazing, neon yellow color. I’ve been drinking plenty of water, so it must be something in the ingredients. #2: Radio silence. It hasn’t happened since I started earlier today (Monday). Tomorrow should be a different story. Lust after real food? : Kind of. See below. With that said, I was surprised by just how bad this stuff tastes. There are no words to describe it. I think wallpaper paste with broken glass would be an improvement. When I had my first gulp, I had to fight to keep it from making an immediate reappearance. Each time I ate some, I had to hold it in my mouth for a couple seconds before I worked up the resolve to swallow it. Whomever described this as “Tasty” has something wrong with them. The DIY soylent filled me up. I started the day eating/drinking (choking down) about 1/6 of the crapcoction. When the hunger pangs came, I’d wait about half an hour and then force down another 1/6. By dinner time, I had consumed about 2/3 of it. Physically and mentally, I felt absolutely no different than I do on a normal day. I worked out with weights and did 200 push-ups; that didn’t feel any different either. 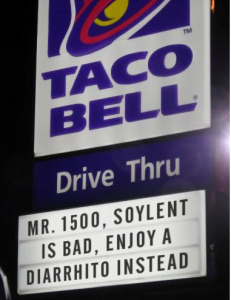 The soylent did satisfy my hunger. Because I felt filled up, I didn’t lust after normal food until the end of the day. Around dinner time, I was really hungry and the sweet and sour chicken that the Mrs. was cooking up nearly killed me. The way to avoid this problem is just to not let yourself get too hungry. Or, have your significant other cook liver. Not gonna do it. Ever. I presented soylent to my children as a vanilla shake, hoping they would try it. They figured out the score immediately and wouldn’t try any either. After sniffing it, the younger one’s expression wouldn’t have been more extreme if my head was replaced with a rat’s. Umm, so it doesn’t surprise me that you’re doing this experiment. It DOES surprise me that you didn’t throw in some agave nectar, cinnamon, and vanilla extract to smooth out the taste a little bit. Try that tomorrow and I bet it will go down a little smoother. Thanks for the tip! I am up for anything. I pretty much squirmed as I read this whole entire soylent update. Good luck with the rest of the days you are attempting! I could definitely not do it. Sorry Michelle! I’m guessing that you won’t be joining me on the gastronomical adventure. Yeah, anything would be tastier than this. Oh man, I had to stop eating my breakfast while I read this. I’m impressed that you’re sticking with it. I’ve done various different diets in the past, but I’ve never wholesale replaced all food, so I remain intrigued. I’m glad to hear you felt OK yesterday. Stay strong! Mrs. Frugalwoods recently posted…Should Our UK Reader Pay Off Her Mortgage? I’m sorry I disrupted your breakfast! I ate half of mine and put the rest back in the refrigerator. Bleh. It’s all fun and games on day 1, Mr. Chuckles. We’ll see how the sense of humor (yours, not the Mrs.’s) holds up through day 5. Hilarious post! Can’t wait to see how this plays out. I know, right? Perhaps this will descend into some “Lord of the Flies” scenario. The police will show up and hopefully I’ll be released within 1500 days. Where is the conch?!? That or it will drive me nuts. The authorities will pick me up after finding me running around naked, yelling incomprehensibly at squirrels. I read this thinking, “Huh, better you than me.” I know David Cain of Raptitude has done the Soylent thing, maybe you were duped into a horrible recipe? Or… It’s just bad. Good luck either way! Yeah, and I read his review too. It was much more positive than mine. Perhaps his recipe had some illicit substance? That, or he has no taste buds. Is it made out of human remains like the Soylent Green from the Scifi movies from the 60s? It would taste better if it were made from people. Couldn’t taste worse! hahah oh boy, good luck with that. I’m now wondering if you’re going to be able to do the whole thing… it’s only five days but still. the yellow pee is from a whole bunch of b vitamins that you’re getting from that contraption. Honestly though, I had heard that this stuff doesnt taste as bad as you’re making it out to be, but I dont really think you’re lying either. Ha, I’m not lying. Keep in mind that I’m using DIY soylent. I’ll bet the official product is much better than the pig slop I’m subjecting myself to. Definitely try mixing some stuff with soylent to see if it tastes better. Alicia recently posted…Happy (Canadian) Thanksgiving! Ha, eating humans would be an improvement over this. Gotta say I absolutely do not get this experiment at all. I love food. I get that some people think food is only fuel, and that taste and dining experience is not important… but I think taste and enjoyment and the whole cooking and eating process is wonderful. And this soylent stuff sounds nasty. Hmmm, I’m adventurous, but liver is off the list. Dunno, I just can’t put it in my mouth. Taste is very important. I love food, especially bad food. I hope that this experiment resets my taste buds a bit. Why are you torturing yourself like this? Is it a detox thing? Or a weight-loss thing? Either way, it sounds like the self-inflicted diet from hell. If it’s detox then fasting for a day (drink lots of water) followed by vegetable soup on day 2 will reset you pretty quick. If it’s weight-loss then you can’t go wrong with Tim Ferriss’s slow carb diet: cut out all white carbs (sugar, bread, rice, etc.) and eat as much fresh veg and protein as you like. You’ll never feel hungry and the weight will just fall off. Nah, detox diets are a scam (your body does a fine job of it without any help from you). I just want a reset. I’ve been eating terrible lately. This is the first step on my way to a better diet. I’m most impressed by the 200 pushups. I am terrible at pushups and can’t do a single normal one. I abhor the term “girl pushups”, but I can do pushups on my knees — only about 10 at a time. Oh, stop encouraging Mrs. 1500! She is obstinate enough without your interference! I must have missed that you were on a Soylent kick! I am looking at bags of the official Soylent in my office right now! I tried to go for a number of days on the stuff and got bloated (apparently they have fixed that issue in version 1.1), but for me, it works PERFECTLY as a substitute for work lunch. You know those meals where you forgot to bring in your lunch and you just don’t care what you eat, as long as it fills you up? That’s when I reach for Soylent. The official stuff isn’t horrible tasting (especially if you buy a little cinnamon shaker to add to it), it’s just sorta like…. nothing. Or maybe slightly like oatmeal. Anyway, for everyone in the comments wondering WHY someone would do this, at least for me, it is a way to get all the nutrition I need in an instant in moments when I don’t really care about what something tastes like. It makes lots of sense. There’s nutrients and vitamins in there without all of the chewing in an easy-to-digest drink. I get it. The real Soylent must be leaps and bounds better than my DIY soylent. I just didn’t want to wait another year for them to ship it. This is fantastic. I seriously considered this experiment myself a few months back. People on the site said it didn’t taste bad. But once I actually did the math on a per meal basis, I realized I could match or better the cost with real food. Yes, more of a mess and more preparation time, and I’m probably not checking off every single nutrient I need, but based on your post, I made the correct decision. Ha, I’m using the DIY version. The real one is supposed to be a lot better. I feel slightly sick just reading this. Glad the little ones have their heads on straight… though why you’re continuing with the experiment is beyond me. Ha! That is the whole point of the blog, public accountability! I can’t quit now.